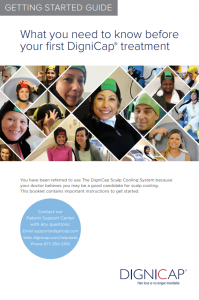 Inform your care coordinator that you intend to use DigniCap so they can schedule your treatment. As soon as you have scheduled your first treatment, create an account on the patient portal at myDigniCap.com. There you can access the Patient Support Center, view your account and share your experience. Once logged in, treatment cost will be shown for your chosen location, as well as directions on how to make your payment. Depending on the facility, payment will either be made at the facility or online through myDigniCap.com. Before each treatment you must log in to pay and consent or DigniCap cannot be used. DigniCap cannot be used without payment and consent. Payment must be made at least 24 hours before your treatment. Once payment is made you will receive a confirmation email that contains a unique 4-digit order number for each treatment. You must bring this order number to the infusion center for your treatment. Financial support may be available. See the Insurance and Financial Resources page on the back of this guide. Prior to your first infusion carefully review the hair care recommendations, which can be found HERE. On chemo day you may wish to take a blanket, neck pillow and towel with you. Ask your nurse what is provided at the infusion center. NOTE: DigniCap offers the ability to reduce hair loss from chemotherapy. However, most patients will still lose some hair. The hair shedding process usually begins around 17 days from your first chemotherapy infusion. Depending on your regimen, it is usually around the second treatment. If you are on a weekly dose, shedding may begin around the 4th or 5th treatment.